The second day of New York Comic Con, the huge convention that allows comic book enthusiasts to mingle with their favorite creators, will be a day that Archie fan Debra Montgomery will never forget. 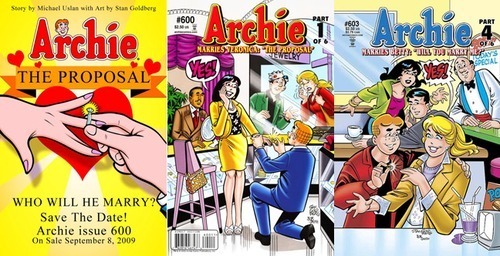 Her creative boyfriend, Jim Alessi, had commissioned Archie Comics artist and writer Dan Parent to draw a special piece of artwork depicting Archie on bended knee proposing to Betty with a diamond ring. 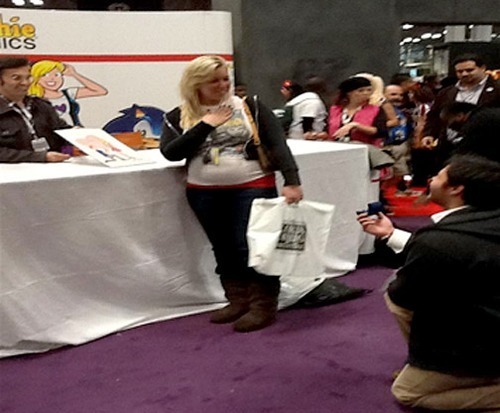 When Alessi brought his girlfriend (who looks a bit like Betty) to the Archie booth to meet Parent and collect the special drawing, Alessi was right behind her â mimicking the pose â on bended knee. When she spun around, she was stunned as Alessi proposed to her in front of an enthusiastic group of Comic Con attendees, bloggers and the press. Of course, she said, "Yes," and the couple embraced. Commenting about the surprise proposal, Parent said, "It was fun. All I had to do was draw, so it was easy." Interestingly, Archie Comics fans may remember a six-part series that ran in 2009 called "The Archie Story of the Century." In issue #600, Archie asks Veronica to marry him â a choice that made some fans livid. In the next two issues, the story details their marriage and life together. But, then in issues #603-#605, Archie asks Betty to marry him and the story follows the couple through their engagement, marriage and the birth of twins. Fans soon learned that the six-part series was simply a fantasy showing how Archie's life would have panned out with each of his two love interests. Created in 1941, the forever-young Archie Andrews has been in a love triangle with Betty and Veronica for more than 70 years. It seems as if Archie, unlike Jim Alessi, will have to wait just a bit longer to pop the question.